A successful morning writing session… in my pjs! My New Year’s Eve morning was spent working on my latest novel. You can’t beat a morning writing session, especially when you’re slumming it in your pyjamas with a Groot mug. Now that I’m 3900 words in across three chapters, it’s time to hand over the story to my harshest critic, the other half. Luckily, she liked what she read. A couple of good points for me to consider too, but on the whole, she really enjoyed it. You may think she’s biased. Trust me, she isn’t, she’ll tell me if something is complete rubbish or not! Are you a fellow writer who writes in their pjs? Feel free to send a snap and let me know where you are at with your latest novel! Planning a Novel – I’m trying out something new! The development of my previous five books all followed a similar format – first came the initial idea, then the fabrication of the world and the characters within it, and then a basic outline of the story’s journey. This usually took the form of my thoughts combined with the plot outline on my iPhone notes; which seems ridiculous looking back! With a new book currently in development, I wanted to try something a little different in preparing myself to write it. Time and patience is the key to writing an effective novel. The initial planning and development of a story is more important than the writing itself. My novel latest novel, DECEPTION: A Love of Lies, relied heavily on the characterisation and plot of the story. This is what drove the story. The initial idea was very different to how DECEPTION is now, but the time spent on researching and developing the plot is what made it the big hit it is today. So, how am I changing my novel planning process? I’m still embracing my mental plotting, but I’m taking the approach of jotting it down on paper, which is why I’ve got my own book planning notebook now! As dull as the image is above, this little notebook of mine has book titles, plots, quotes, character profiles and backstories inside it. I’ve separated the various elements of the novel up. The notebook currently contains a book title page, character profile page, character background page, key events page, quotes page, writing inspo page and genre theme page. With the divided pages, I’m able to jot down my ideas in basic note form. All the ideas I note down aren’t guaranteed to feature in the book when I come to write it, but it allows me to plaster my ideas and let me review it over time when the time arrives for me to start writing and put the plot together. My character profile and background pages were looking very full to begin with, mostly because the protagonist in this novel was the key to the story; it all started with her (there’s an exclusive for you all!). I’d love to know what your novel planning process is. If you’ve tried many ways to plan your books and have both terrible and great experiences, I’d love to hear them! My Dark Fantasy eBook Alive has a new book cover, and it’s FREE on Amazon! My dark fantasy eBook, Alive, has a brand new book cover. It’s also free to download from January 12th to the 15th! I’m really excited to officially reveal the new front cover of my eBook dark fantasy short story, Alive. Feast your eyes on the new book cover! It’s a massive improvement on the last cover for Alive and truly echoes the darkness, fear and suspense of the story. 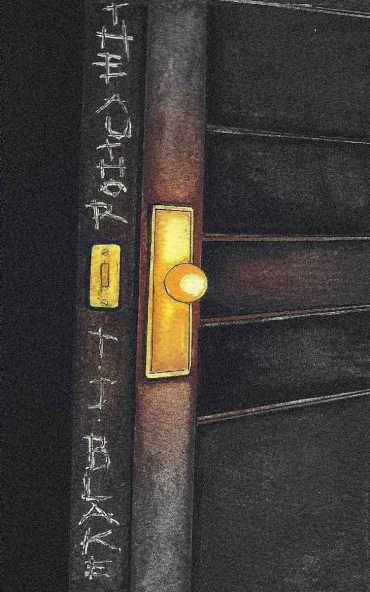 This amazing cover wouldn’t have been possible if it wasn’t for the talent of Jordan Baker from The Bakery Creative. Thank you for helping me and well done for doing a fine job! Although it may seem biased of me to say, but I love Alive. It may only be a short story, but it’s one I really enjoyed writing and re-reading. I read it recently and it had me on edge. Download Alive for free from Amazon on Kindle from 12th-15th of Jan! Alive will be free to download on Amazon for the weekend – starting tomorrow the 12th of January, and lasting until Monday the 15th. Once you’ve read it, I’d love to hear your thoughts, so why not leave a review too! This may be old news to some of you because I posted this on my social media, but my latest psychological thriller, Deception: A Love of Lies, is available to purchase from Waterstones and WHSmith. It’s a great achievement, mostly because my previous books did not make it onto WHSmith, but Deception has! It’s currently out of stock on WHSmith, but it’s available elsewhere in paperback and eBook. It’s great that it’s listed on WHSmith, and I am trying to speak to the distributor to see if we can get a description added into the book’s product page, as well as get it stocked in stores. I’ll also admit, it’s quite pricey in WHSmith. However, on Waterstones, it’s available for a cool £7.50. Deception: A Love of Lies – worth the read? If you’re wondering whether Deception is worth reading, then you should see the incredible ratings it’s received on Goodreads from readers across the world. I love this book – it’s easily my favourite out of my books, and it’s all because of the main character, Billy. I know I’m slightly biased, but I’m confident that if you enjoy a psychological thriller with intricate characters and detailed characterisation, then you’ll enjoy Deception! Grab a copy of Deception today by heading over to Waterstones, Amazon or Barnes & Noble, and see what others are saying about Deception on Goodreads! Be careful when looking at reviews, there’s potential for spoilers! 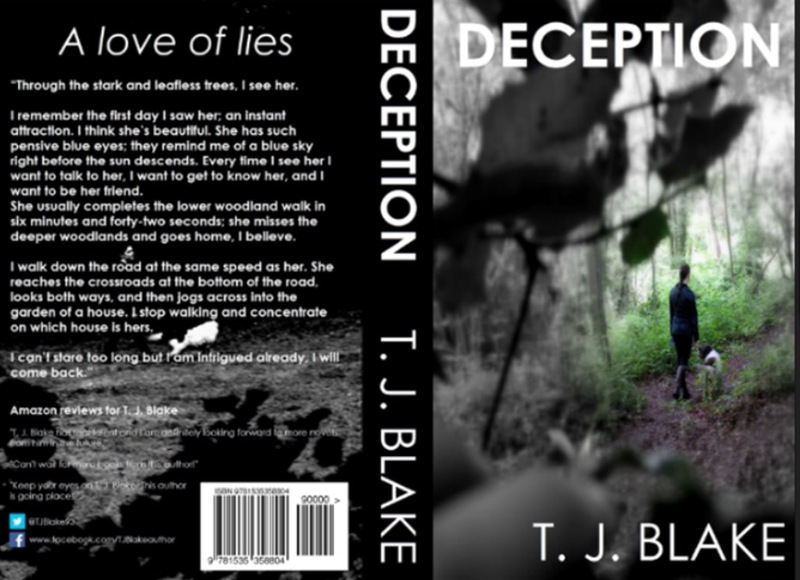 It’s been a while since I last blogged, but I thought this was definitely worth a quick post – Deception: A Love of Lies has two more 5 star reviews! They have been posted on both Amazon US and UK. ‘So what exactly is Deception about?’ I hear you asking. 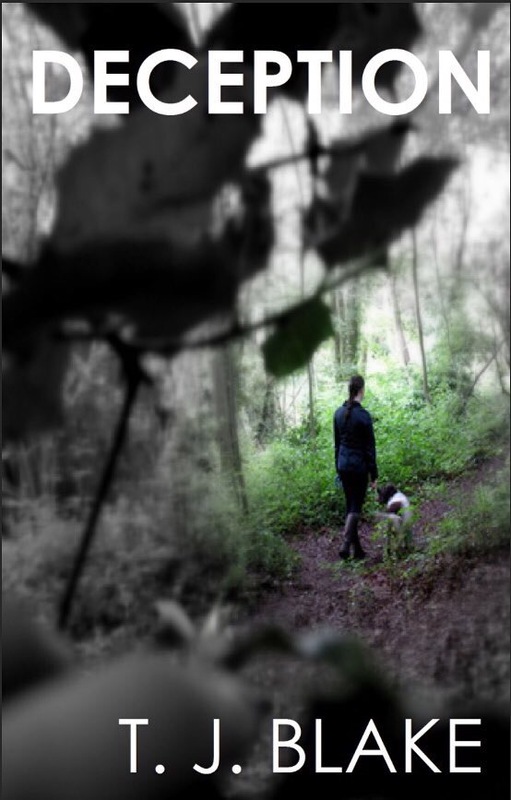 Take a look at the synopsis below and allow yourself to live the life of avid dog walker, Billy Allen. FINALLY – there will be a spotlight feature on another blog Thursday, which will be hosting a giveaway of three eCopies of Deception, so keep an eye out for that in the 1st of December. 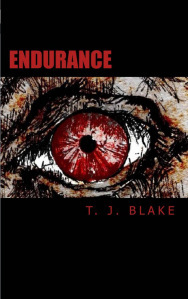 My books Endurance and The Author will also be free to download from Amazon on the 1st of December also! You’re probably asking yourself the question, ‘what exactly can I expect from Deception?’ Well, I can tell you that it’s not your typical thriller novel. 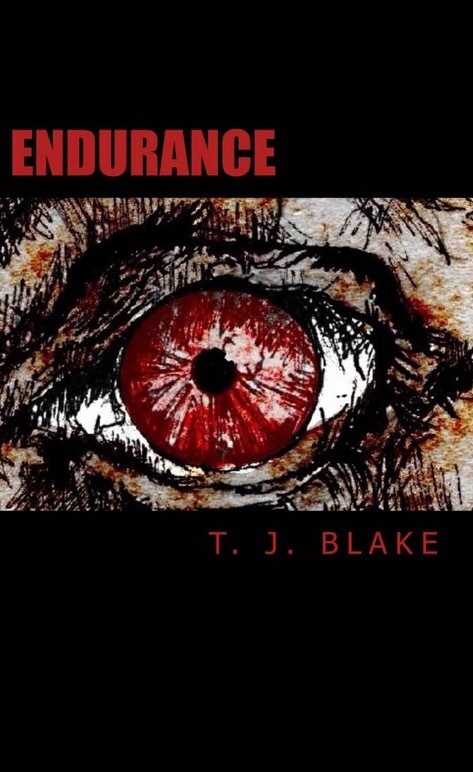 I would describe it as an intricately detailed psychological thriller, which will have you following clues and trying to piece the story together; along with trying to understand the behaviour and past of the main character, Billy Allen. The latest 5 star review on Amazon and Goodreads, posted by justafarmer4, has given an appreciative nod to the extremely detailed story telling and rare characterisation technique of Deception. “This one will keep you wondering from the very beginning. I don’t often read an entire novel in one sitting, but this one kept me turning pages until 2 a.m. 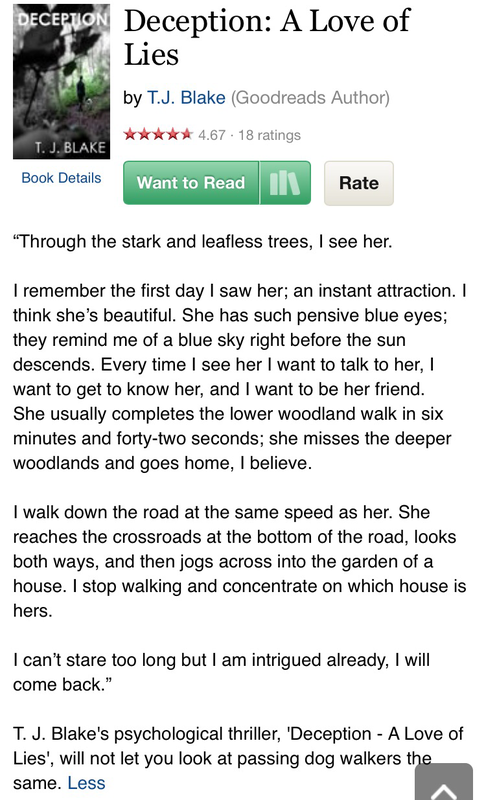 The story begins with an excruciatingly detailed description of walking in the woods. Extremely, minutely, detailed and I thought, ok, get on with the story already! Then I realized: this was a most central facet of the main character, Billy. It’s the first time I have encountered using setting observations as characterization. And it’s done brilliantly because Bill’s attention to detailed observation is who he is, how he has let it take over how he views his life, and it is how it ultimately fails him, thus leading to this twisted tragedy. His “peeping tom” episodes concerned me tremendously, and initially put me off feeling any sympathy whatsoever for Bill, but they were also an important part of the characterization and understanding the hows and whys of his mental state. I’ll wrap this up by returning to the topic of excruciating details. The novel is jam-packed with them, which lends extremely well to the constant misdirection. 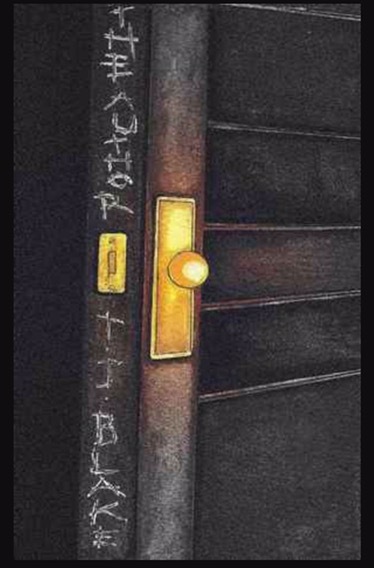 All of the clues are there, hidden in plain sight. Such a cliché for me to say, but it is indeed very close to “not seeing the forest for the trees”. 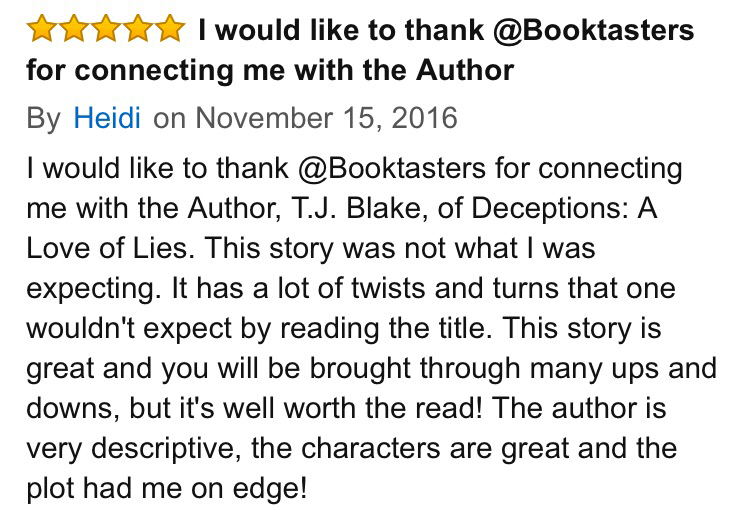 This reader has a great reading of Deception,and fully embraced the book for what it stands for. Get your copy of Deception either as paperback or on Kindle/eBook now. Is there a better way to praise a book? I’m extremely pleased to see that my readers are enjoying Deception, with more 4 & 5 star reviews popping up – but a comparison with Gillian Flynn’s Gone Girl is really impressive. I enjoyed reading this particular review, the reader has clearly enjoyed getting to know the characters and thoroughly enjoys the ‘Deception’ of the story. You can see their full review on Amazon. 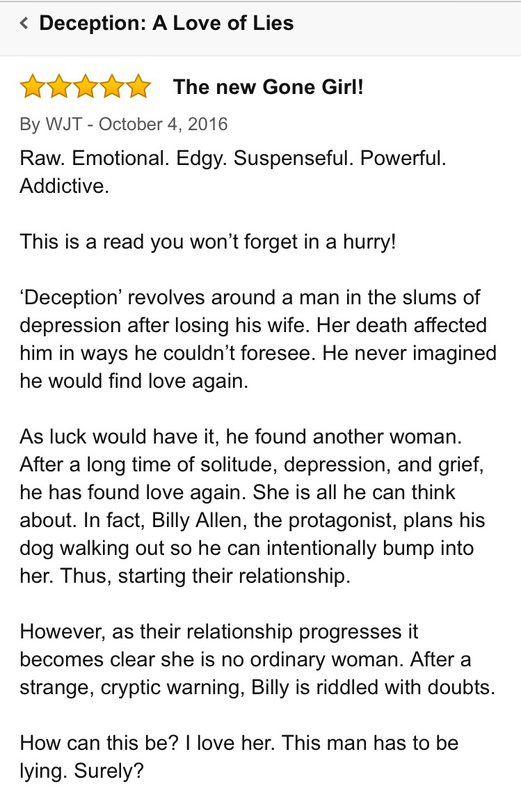 If you want to read a psychological thriller which will have you looking over your shoulder and questioning your loved one, then Deception is for you! Get your copy today on Amazon and Smashwords.